Bobby May is a legend, in his own right, and the type of rare breed that is not common nowadays. He has been a court reporter for the past 70+ years, and in a society when employees rarely stay with a career until retirement age, that is indeed rare. go in the dairy business, but after hearing a recruiter speak at his country school, Bobby decided to go to court reporting school to avoid milking cows. After being drafted into the Korean Conflict, Bobby began working for the JAG office in Japan, reporting court martials. Bobby’s first job was for a Dallas County Grand Jury beginning on June 1, 1949, earning $250/month. After two years, he married his sweetheart, Mary Jane, a telephone operator for Southwestern Bell, in March of 1951, and was drafted into the U.S. Army in July of the same year. “As often as they shoot at the rest of us,” was the reply, and so he elected to go through infantry training and learn weaponry as well as his medic training. After 16 weeks of training, Bobby was shipped to Korea. Upon disembarking the ship, he headed directly for the JAG office and explained that he could be much more help as a court reporter than a medic. The JAG office agreed, and they put him to work as a court reporter the very next day. Bobby and his wife, Mary, were married during March 1951. When Bobby was released from the Army, he returned back to Texas and needed a job. He made some phone calls and went to work for a court covering Carthage and Center. 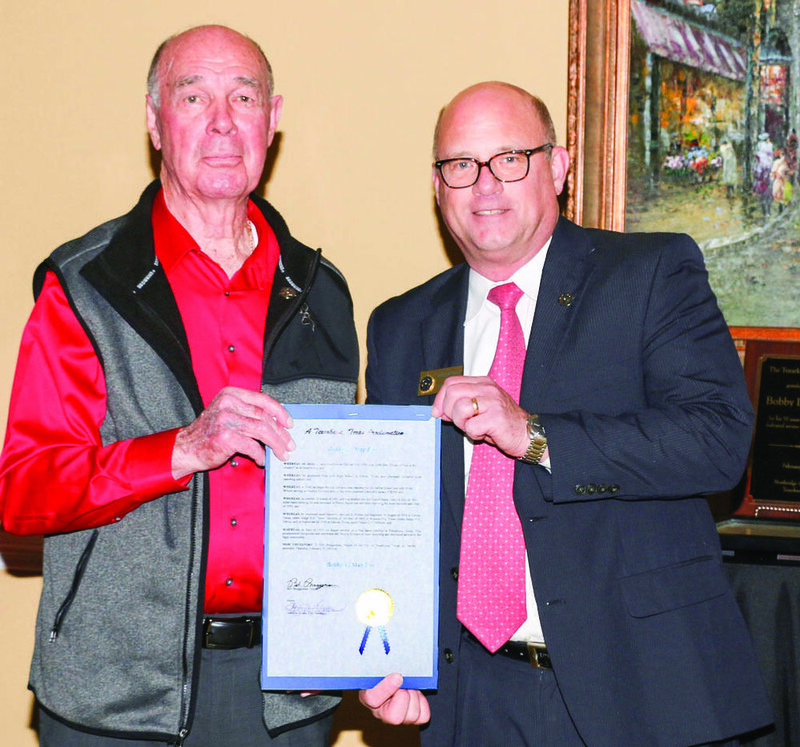 On February 21, a reception was held at Northridge Country Club honoring Bobby for his 70+ years of court reporting service. He was also presented a Proclamation announcing the day as Bobby May Day in Texarkana. Bobby (in the red shirt) with his family members: Matt Combs, Joey Combs, Carrie Slay, Larry May, Jason Combs, Tom Talley, Randy May, Norma May, Jack May, Shedera Combs, Dana Asher, Eloise Talley, Helen Asher, Wesley “Otis” May, Jessie May, Cherie Davis and Marinda Thomas. from left to right: Bobby with Texarkana Texas Mayor Bob Bruggeman; Darby Doan, representing the Texarkana Bar Association, congratulates Bobby. ; The Texas and Arkansas Bar Association’s Louise Tausch shakes hands with Bobby. ; Justice Ralph Burgess, from the Texas Court of Appeals, hands Bobby the commemorative plaque.